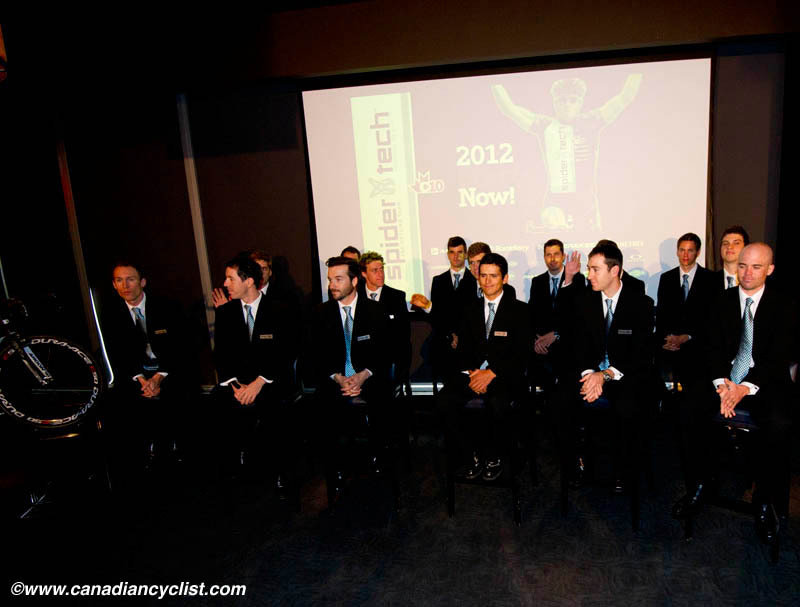 Today, Team SpiderTech powered by C10 introduced their 2012 team - all members were present except Zach bell, who is racing in Cali, Colombia at the Track World Cup with the Canadian National Team. The team was introduced in Toronto, at the Air Canada Centre. Team owner Steve Bauer pointed out that in its first year at the Pro Continental level, SpiderTech had eight UCI wins, 30 podiums and 60 top-10 finishes; and hopes to improve on that next season. We have interviews with a number of the riders, Steve Bauer and an interesting one with Bill Payne, VP of Marketing at sponsor SpiderTech, who discusses the value of sponsoring the team for his company.